January 2018 Cancer Horoscope foretells that you have to keep aside free will and outer ambitions for a while. The western half of the horoscope is filled with more than 80 per cent of the planets. Hence your life is governed by the whims and fancies of other people and Cancer zodiac sign will have to adapt yourself to situations. Just stay calm and allow things to happen with the grace of others. Collaboration and teamwork are necessary to succeed in life during January 2018 for Cancer people. 2018 astrology forecast predicts that you will encounter chaos and confusion in the working place. You can expect significant changes in management and office environment. But things will change drastically during the last week with the influence of Jupiter. You can expect improvements in your financial situation with promotions and rewards. Your diligence is the key to success. Travel for business purposes will bring good results. People pursuing fine arts will have plenty of opportunities to excel in their fields in the month of January. 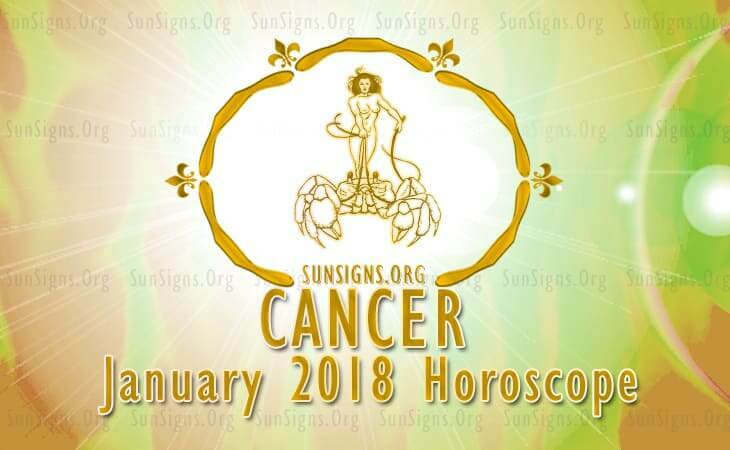 The Cancer 2018 zodiac predictions for Finance suggest that monetary prospects are not rosy in the month of January 2018 for Cancer people. You have to wait for better days to come by being patient. Do not indulge in risky investments or unnecessary speculations. The solar eclipse will have a negative impact on monetary situation till the 22nd. Financial situation of family members will also be under stress. Any new partnership will have to withstand financial turbulence. The Cancer monthly zodiac predictions for 2018 indicate the influence of Pluto and Mars in your love and family relationships. Problems may arise between family members on financial aspects. Present relationships will either survive or break up depending on the soundness of love between partners. Love will be fabulous after the upheavals. You may even plan for getting a baby predicts this 2018 monthly horoscope. People in relationship will have problem in balancing their love life and working life. Disagreements will be frequent between lovers. Singles will have better luck in their love affairs and will be able to get into relationships easily. Relationship with children will be harmonious. Children will do well in their academic and artistic careers. Health astrology is forecasting that health of Cancer personality requires sufficient care this month and overindulgence should be avoided. Preventive maintenance is the key for good health. To sum up, January 2018 Cancer Horoscope suggests that the month will be tricky for Cancer born individuals and there will be plenty of turmoil and confusion. Refer Love Horoscope 2018.